I used this lesson to reinforce the concept of showing space or depth in an artwork through color value and size. 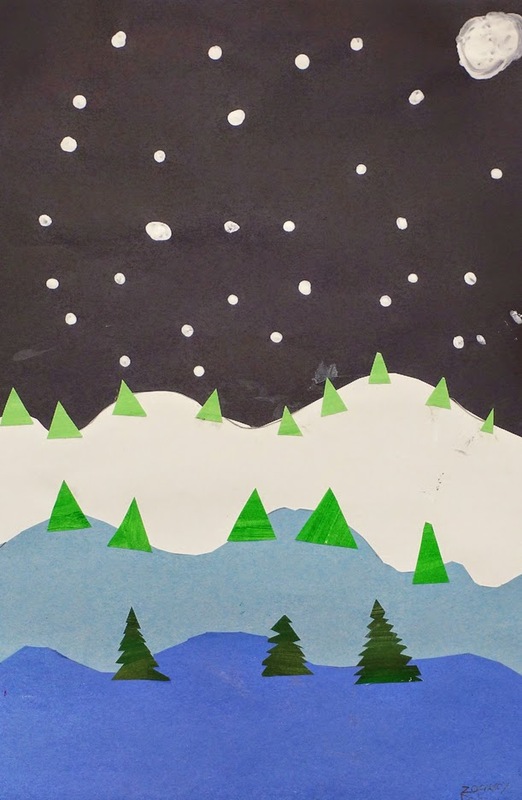 First, students created a simple winter landscape using two values of blue, along with white, construction paper on a black background. We used the formula of "1/2 white, 1/3 light blue, and 1/4 dark blue" to come up with good proportions of each color to the others. Then the students created three values of green paper using a medium green, black, and white tempura paints. The following week, they cut trees of three distinct sizes from these values, making sure to use the darkest value for their closest and largest trees, their medium value for their medium sized trees, and their lightest value for the smallest and most distant trees. Some students chose to add a little more detail to their largest/closest trees. While most of my students at this grade level are already familiar with the term "background," the lesson offered a good opportunity to introduce them to the concepts of "foreground" and "middle ground" as well.